Work from Home and become a Knife and Tool Sharpening Professional in your own local area. Break away from the rat race, ‘Be Your Own Boss’ and achieve your own Lifestyle and Financial goals! Maximum Net Profit to You! Make a fresh start in your life! Call for a ‘no obligation’ chat on how we can help you become a Sharpening Professional. Register your interest in our Business Opportunity (Complete Package) and we will include these additional items free if you sign a contract within 90 days. It’s that easy. Register today! 1 x ENGEL MR 40 F Fridge/ Freezer This will save you hundreds of dollars by being able to keep your lunches and drinks cool in summer. Easily moved into your home or car for picnics. Additional 2000 extra fridge magnets With a total of 4000 magnets, you will be able to do extensive local marketing at no cost other than your time to “drop in and see people” to gain many more customers. 1 x 2 metre rain and shade awning fitted to service body. Will make life a lot easier on those extreme days. Disclaimer: This promotion is for the complete system only. The items may vary slightly depending on availability and the vehicle displayed is not included in the offer. Have you ever thought that there might be an easier or better way to earn a living? Well, we might just have what you are looking for. Flamin' Sharp has been in the sharpening industry for over 25 years. 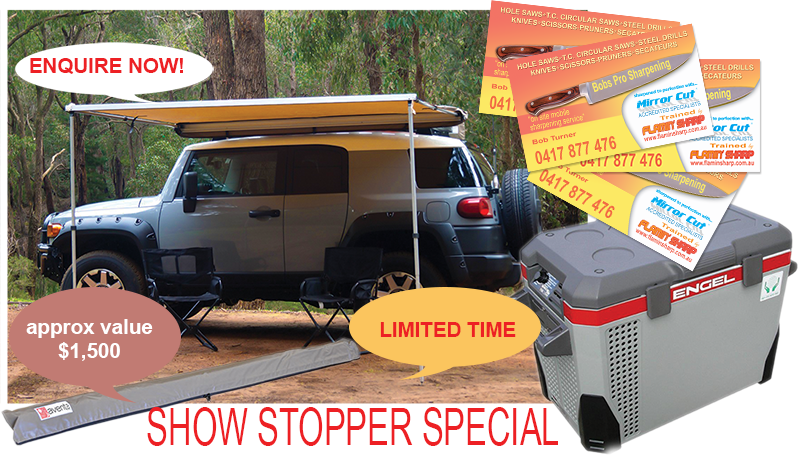 Whist we have travelled extensively Australia wide over the last 10 years full time sharpening, it soon became evident that there was a total lack of Mobile Sharpening Services in most localities. This system will enable you to run a profitable, low overhead home based business. This is not a 'FRANCHISE'. The new business owner will be fully independent. There will be No Territorial Restrictions and No Ongoing Service Fees. You will be able to run your business as you see fit and you put your own brand on it so that your customers know it is you and no one else. You can choose the hours you work, which could be from a 'part time' lifestyle choice to a full time operation, tailored exclusively by you to give you the freedom to meet your own financial and life style goals. As you can see from our comprehensive web site, we have 4 distinct client bases with the added advantages of Low Overheads, Low Consumable Costs and Repeat Work because every knife and tool will eventually become blunt. Under every roof, there will be items that need sharpening. The Mobile Sharpening Industry is a huge and as yet untapped market, with the potential of unlimited growth and your chance to become a 'Sharpening Professional' who will be held in the highest regard by your loyal clientele. Break away from the 'rat race' and take charge of your own destiny and call us now for a no obligation chat.